Celebrated chef and healthy-living expert Sam Talbot shows us how to make wildly delicious, nourishing food—using healthy, wholesome ingredients.Bursting with 100 whole-food recipes and down-to-earth advice about clean eating, this cookbook proves that eating 100% real food is an enjoyable choice you can make every day. 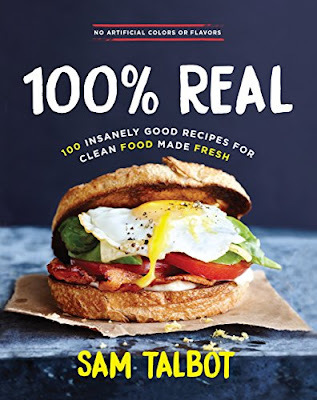 Chef Sam Talbot's nourishing dishes are overflowing with natural flavor and free of processed ingredients, questionable additives, sweeteners, or preservatives.Packed with vibrant personality and more than 150 photos, this cookbook is a real-world guide to un-junking what we feed ourselves and our children. Sam explains how to find seasonal ingredients and offers tips on stocking your pantry with game changing ingredients, like coconut oil and chickpea flour. Many recipes are gluten-free, vegan, vegetarian, or dairy-free.Forget fat-free, low sodium, zero trans-fat, and the like—the hottest new food claim is not needing a claim at all. Eat. Real. Food.